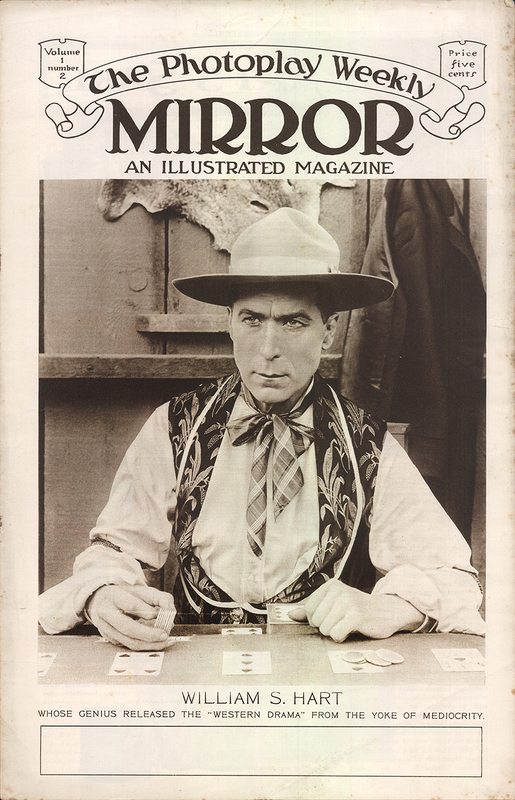 SCVHistory.com LW2788 | Film-Arts | William S. Hart on Cover, Photoplay Weekly Mirror (Tabloid), 1916. Actor and future Newhall resident William S. Hart graces the cover of The Photoplay Weekly Mirror, An Illustrated Magazine, Vol. 1, No. 2 (week ending Oct. 7, 1916). Caption reads: "William S. Hart / Whose genius released the 'Western drama' from the yoke of mediocrity." Issued by Photoplay Mirror Publishing Corp. of 263 9th Ave., New York City, The Photoplay Weekly Mirror was a profusely illustrated 8-page, 10x16-inch, tabloid-format movie fanzine printed on newspaper stock or similiar. There is no story relating to Hart inside this edition. LW2788: 19200 dpi jpeg from original item purchased circa 2005 by Leon Worden.